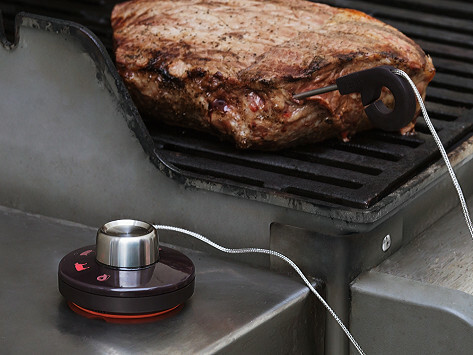 The Range Dial Grill is a versatile wireless cooking thermometer that can be used with or without your iPhone, designed for smoking and grilling. Turn the machined stainless steel knob to set an alert, or use the iOS app for more control. It's quick-to-use and has a magnetic base to stick easily to your grill, too. Dimensions: 2.9" x 2.9" x 1.6"
Knowing the precise temperature of your cooking can make the difference between a perfectly executed recipe and a disappointing dish. Range smart thermometers give accurate readings in a matter of seconds—and can alert your smartphone as soon as the roast, cake, or home brew is done. The Range app also remembers recipe successes, so they are ready to repeat next time. Developer John Kestner's idea for Range was a natural extension of his graduate work at the MIT Media Lab. There he explored the “internet of things” movement, which brings everyday household objects into the digital age. Made of food-grade silicone and stainless steel, Range thermometers have tough silicone cables that can withstand 450ºF. Leave one end of Range in the oven and the other outside, and read the temperature without even opening the door. Range comes in 3 models tailored to the task at hand. The Dial Smart Cooking Thermometer is best for indoor use, while the Grill model is best for outdoor grilling. The Smart Thermometer is best for brewing or making candy, yogurt and more. But any model can be used to help you perfect any recipe. With Range, the benefits of connected cooking are delivered straight to your plate.